I'm slightly concerned that I've become obsessed with jumpsuits. Given that a year ago I'd ruled them out as options only for the "long and lean" I've acquired quite the collection. 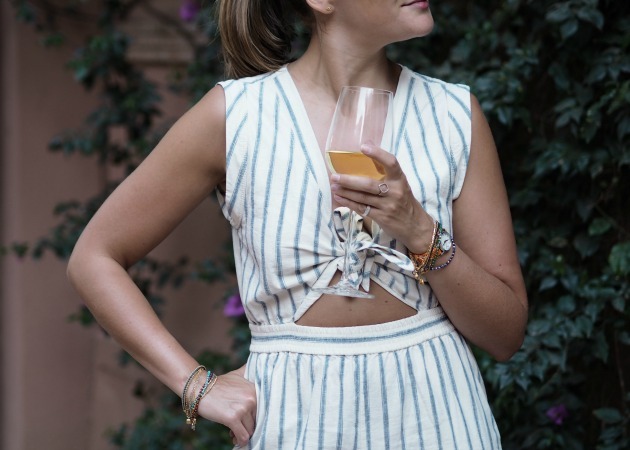 This one from Madewell (J Crew's funky little sister) made the perfect weekend outfit when I had to mix bouncing around town with meeting the girls for drinks in the evening. I love the fit of it; the wide leg, the peep hole (wearing a normal bra with this and it doesn't show), the elastic waist... It was really, really comfortable and got a lot of "ooooooh where is that froms" with the girls... Not a bad price either considering it's an entire outfit. I could go on but I'll make it easy for you; buy it here. I wore it during the day with my white Birkenstocks... Are they still cool or have they gone back into "mum" territory? To be honest I don't really care, but good to know. For the evening I swapped them for my new pumps from L.K.Bennett. It won't come as any surprise to long term readers of the blog that they are the Floret shape as I love them and have quite a few pairs. This shade of blue is just brilliant, I'm wearing them to death and they still look like new... Get them here, and I have my idea on their apple green ones here too. Accessories wise, I never stray far from Astley Clarke and these Gucci sunglasses are my favourites (which says something as I have quite a few pairs now). It's not the first time I've blogged about them and they're past season now, but I'd really recommend Gucci as an eyewear brand as they're really nice to wear... See their collection here. For cheaper options, ASOS have some really nice floral print ones here. Great outfit!! Does the jumpsuit come up true to size?